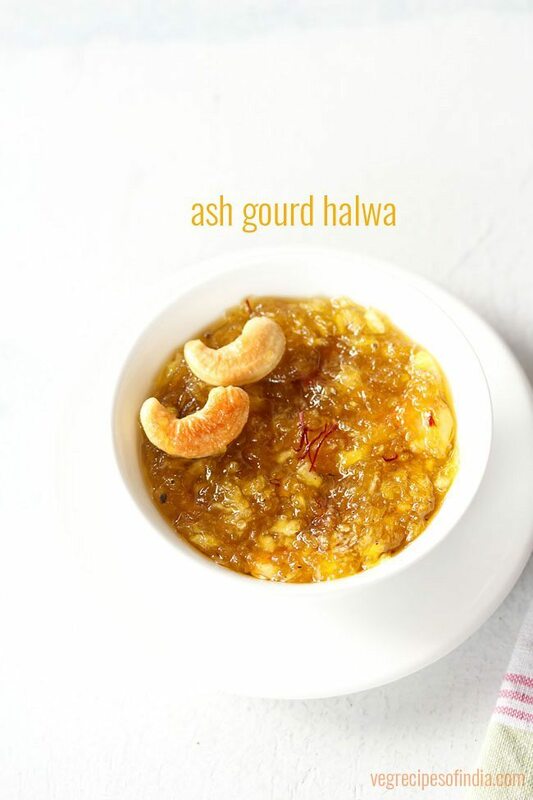 ash gourd halwa or kashi halwa or dumroot halwa is a delicious halwa made with ash gourd or white pumpkin. ash gourd halwa recipe with step by step photos – delicious halwa made with ash gourd or white pumpkin. 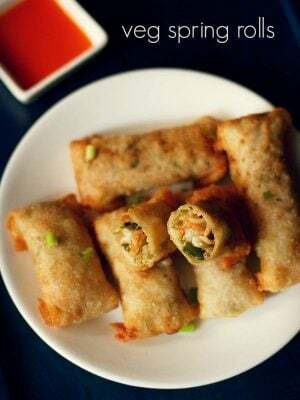 the recipe comes from udipi cuisine. 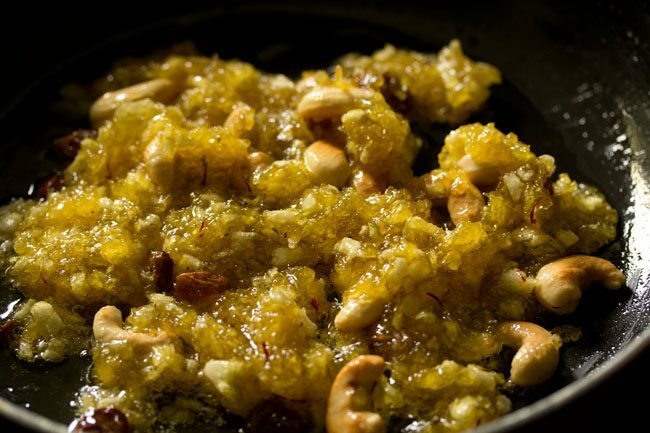 its also known as kashi halwa and dumroot halwa or dumrote or white pumpkin halwa. ash gourd is also known as petha in hindi, poosanikai in tamil and kumbalanga in malayalam. 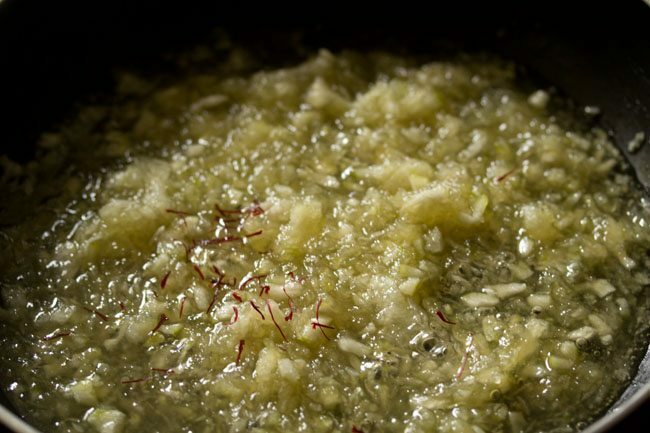 there were a few requests for the recipe of ash gourd halwa. so i had made the halwa some time back. hence thought of posting it on the occasion of navratri festival. 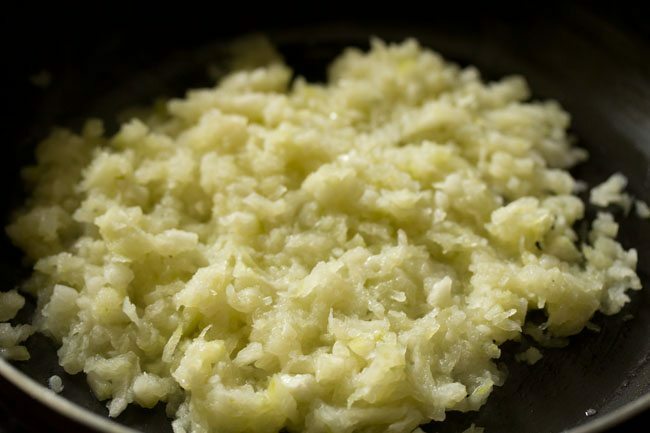 the recipe is very easy to make and you won’t believe that the halwa is made from ash gourd. 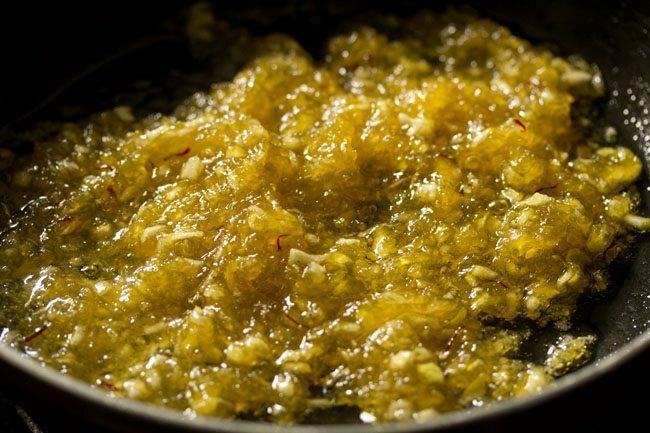 serve kashi halwa as a dessert or a sweet. you can also prepare the halwa as a naivedyam and offer to the deities. the same recipe can be used to prepare pumpkin halwa. i have also posted a version of pumpkin halwa which uses less sugar and ghee. 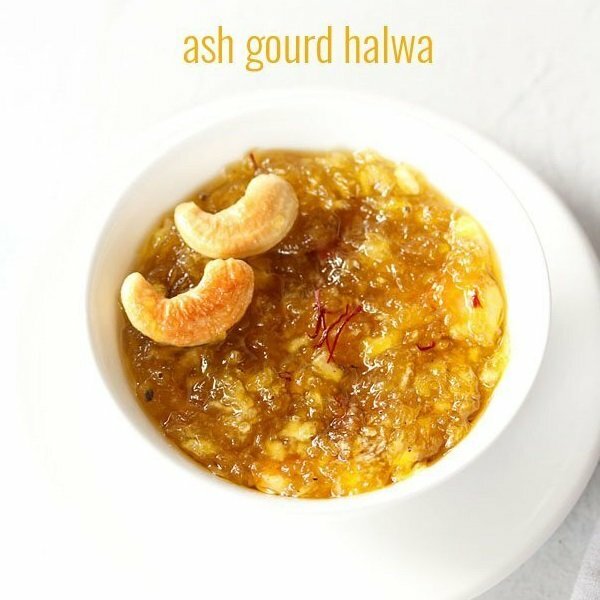 if you are looking for more halwa recipes then do check atte ka halwa, rava kesari, sooji halwa, badam halwa and besan halwa recipe. firstly rinse and then peel 315 grams ash gourd. remove the seeds and the white pith. 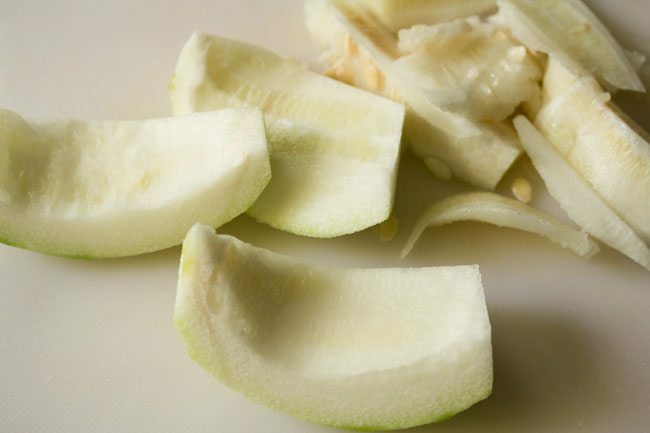 then chop it in large pieces, so that you can easily grate. grate the ash gourd. keep aside. 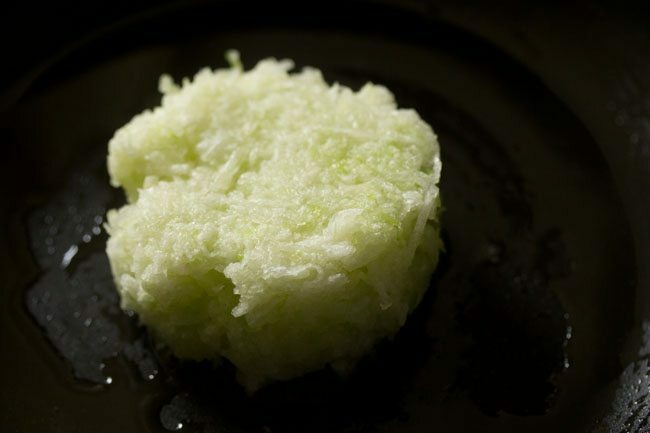 you will need 1 cup grated ash gourd. heat 1 tablespoons ghee in a thick bottomed pan. add 12 to 15 cashews. you can even add less cashews. saute till the cashews turn light golden. then add 1/2 tablespoons raisins. you can add less raisins or skip them. stirring often, saute the raisins till they swell and puff up. 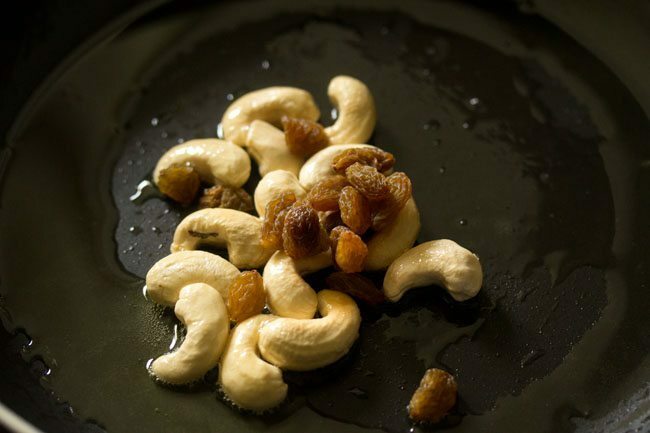 remove both the cashews and raisins with a slotted spoon. keep aside. 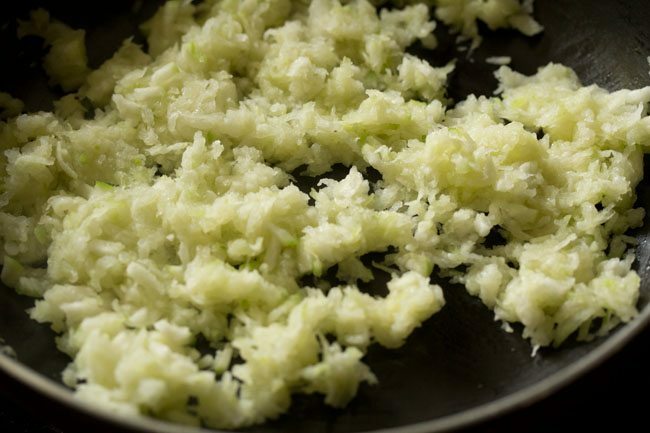 lower the flame and in the same pan, add the grated ash gourd. mix very well. cover the pan with its lid and cook the grated ash gourd till its raw aroma goes away. do check after every 4 to 5 minutes. usually ash gourd has enough water to cook in its own juices. but if the ash gourd starting sticking to the pan or getting lightly browned and the mixture looks dry, then add water. i did add water as all the mixture had become dry. i added 1/4 cup water and cooked the ash gourd with the lid on the pan. you have to cook the ash gourd till all its raw aroma goes away. it took me around 15 minutes on a low flame. time will vary depending on the pan thickness, size, dimensions and the flame intensity. so keep around 10 to 15 minutes time for cooking ash gourd. now add sugar and mix it very well. then add a generous pinch of saffron strands. saffron strands are used to give a nice orange-yellow color to the halwa and also for aroma. if you do not have saffron strands, then skip it or use an orange natural coloring extract. mix saffron with the mixture. keep on stirring and sauteing the halwa mixture on a low flame. once the mixture starts thickening, you will feel a bit heavy while stirring the mixture. the lightness that was there before won't be there. 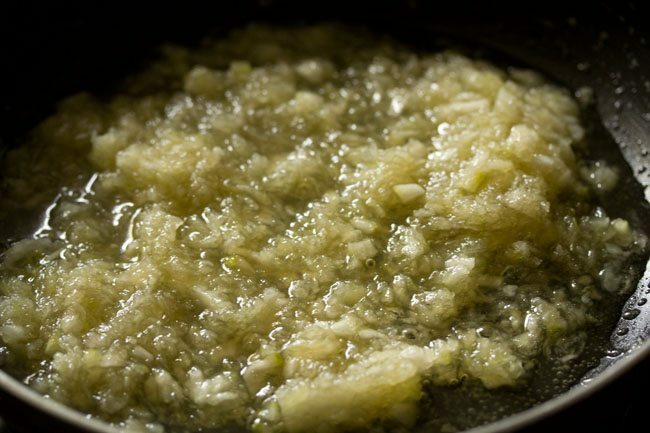 the halwa mixture has to be stirred often and sauteed on a low flame till it thickens and starts to leave the sides of the pan. 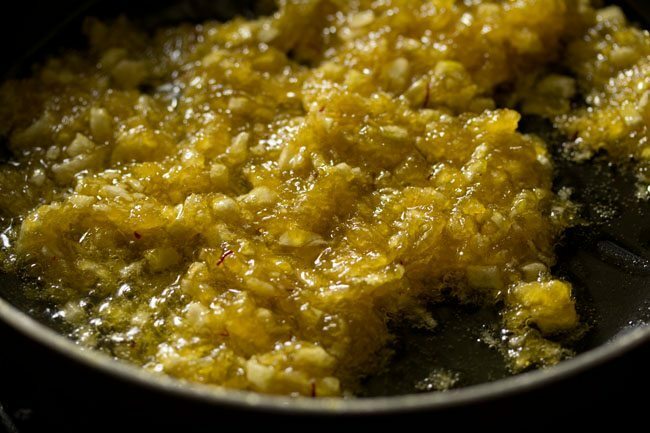 once the halwa mixture thickens and starts separating from the pan, then add 1 to 2 tablespoons ghee. 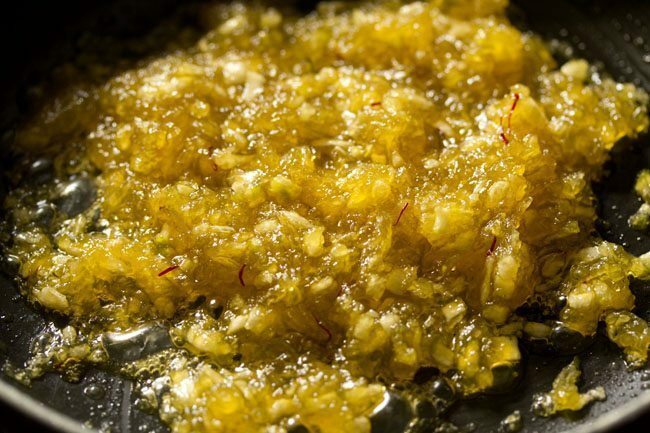 mix the ghee very well. 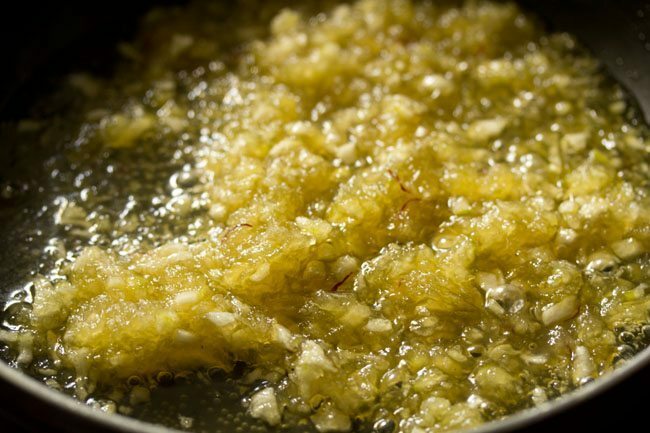 after adding ghee continue to saute on a low flame till the halwa starts separating from the pan. this will take 2 to 4 minutes. then switch off the flame and add 1/4 teaspoon cardamom powder. also add the cashews and raisins. let the kashi halwa cool down a bit and then serve. avoid serving hot as its very hot due to the sugar syrup consistency. 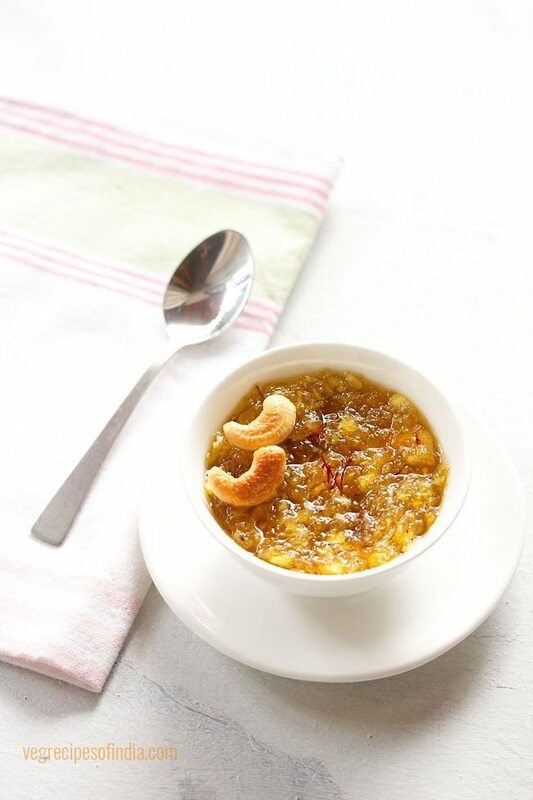 you can even serve white pumpkin halwa warm or at room temperature. 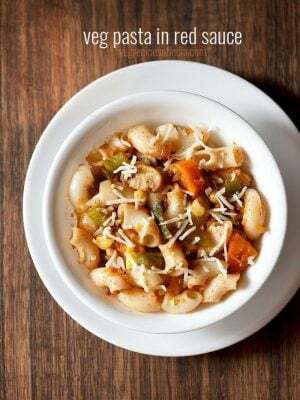 - you can add less cashews and raisins if you want. - the recipe can be doubled too. 1. firstly rinse and then peel 315 grams ash gourd. remove the seeds and the white pith. then chop it in large pieces, so that you can easily grate. 2. grate the ash gourd. keep aside. 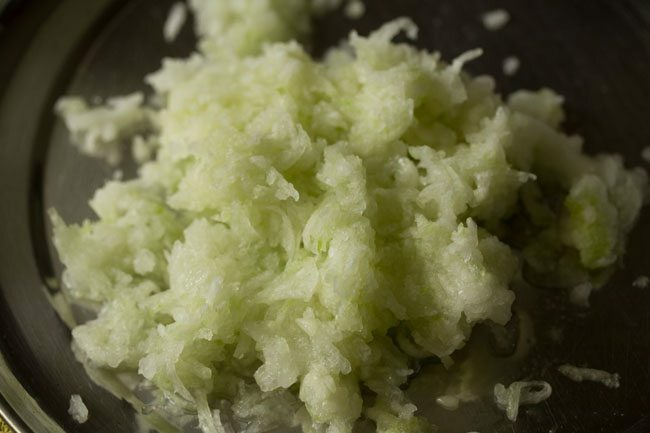 you will need 1 cup grated ash gourd. 3. heat 1 tablespoons ghee in a thick bottomed pan. 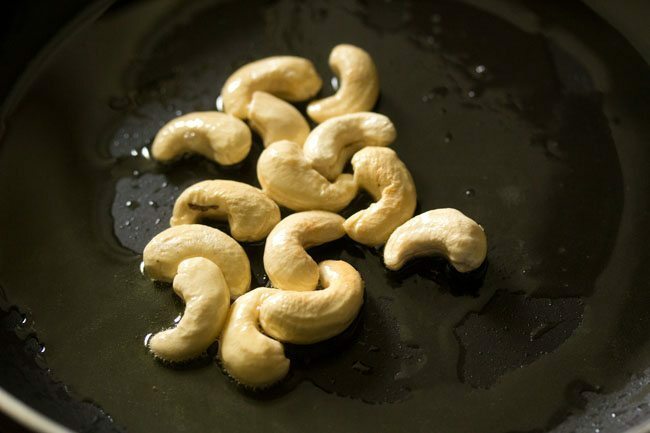 add 12 to 15 cashews. 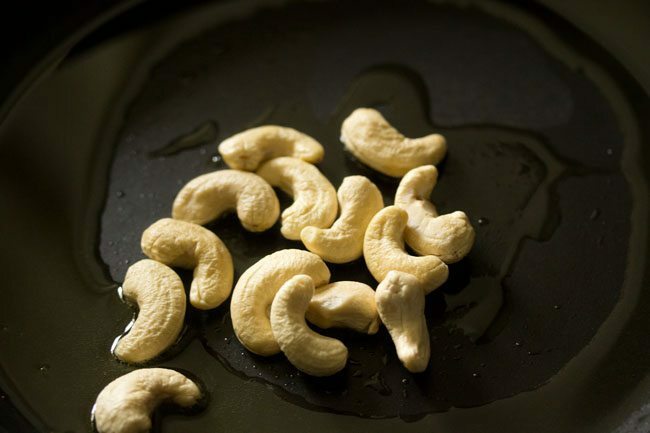 you can even add less cashews. 4. saute till the cashews turn light golden. 5. then add ½ tablespoons raisins. you can add less raisins or skip them. 6. stirring often, saute the raisins till they swell and puff up. 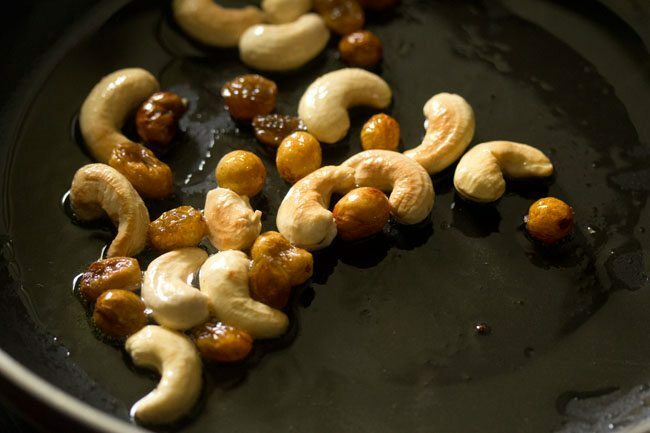 remove both the cashews and raisins with a slotted spoon. keep aside. 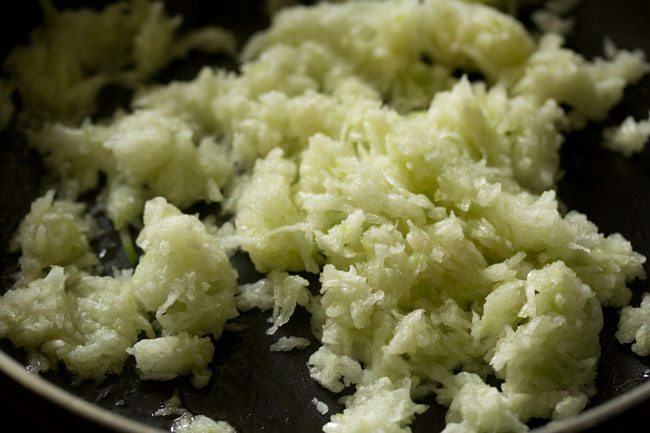 7. lower the flame and in the same pan, add the grated ash gourd. 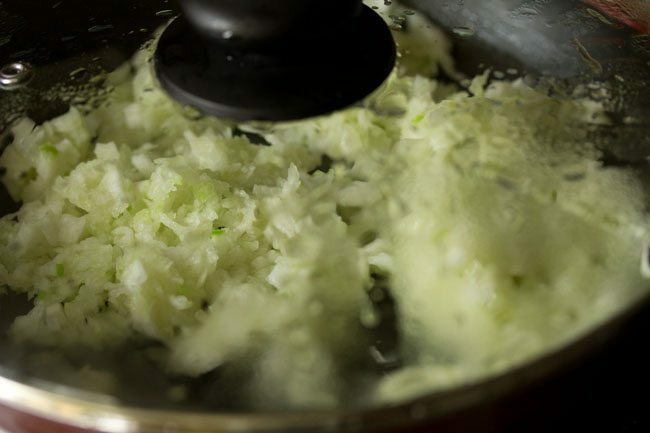 9. cover the pan with its lid and on a low flame, cook the grated ash gourd till its raw aroma goes away. 10. do check after every 4 to 5 minutes. usually ash gourd has enough water to cook in its own juices. 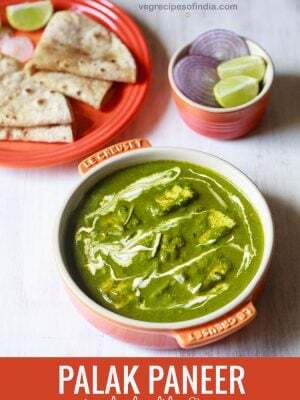 but if the ash gourd starting sticking to the pan or getting lightly browned and the mixture looks dry, then add water. this will depend on the water content in the ash gourd. 11. i did add water as all the mixture had become dry. i added ¼ cup water and cooked the ash gourd with the lid on the pan. 12. you have to cook the ash gourd till all its raw aroma goes away. it took me around 15 minutes on a low flame. time will vary depending on the pan thickness, size, dimensions and the flame intensity. so keep around 10 to 15 minutes time for cooking ash gourd. 13. next step is to add sugar. 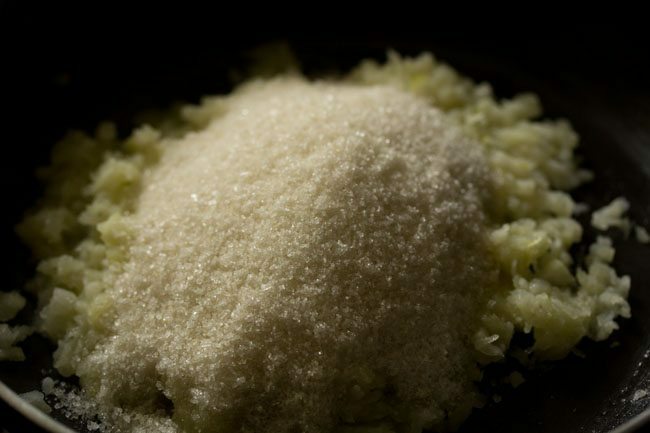 14. mix the sugar very well with the ash gourd. 15. then add a generous pinch of saffron strands. 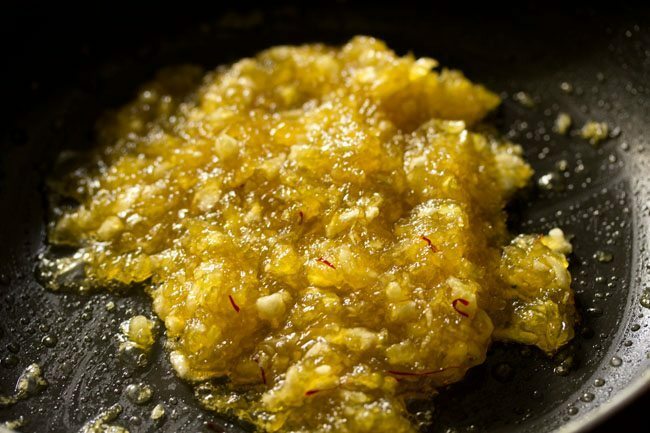 saffron strands are used to give a nice orange-yellow color to the halwa and also for aroma. if you do not have saffron strands, then skip it or use an orange natural coloring extract. 16. mix saffron with the mixture. 17. keep on stirring and sauteing the halwa mixture on a low flame. 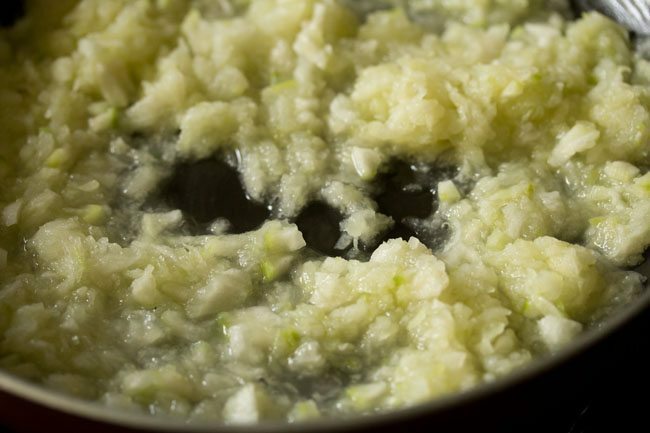 18. once the mixture starts thickening, you will feel a bit heavy while stirring the mixture. the lightness that was there before won’t be there. 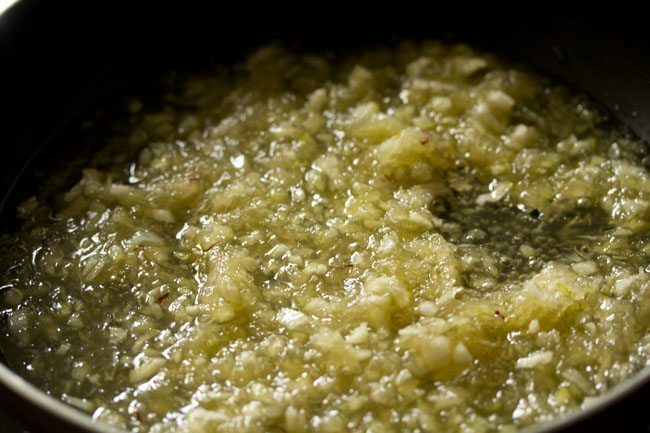 19. the halwa mixture has to be stirred often and sauteed on a low flame till it thickens and starts to leave the sides of the pan. after adding sugar, it took 10 minutes for the halwa to come to the consistency as shown in the below pic. so it may take between 6 to 10 minutes, depending on the type of pan, metal thickness etc. 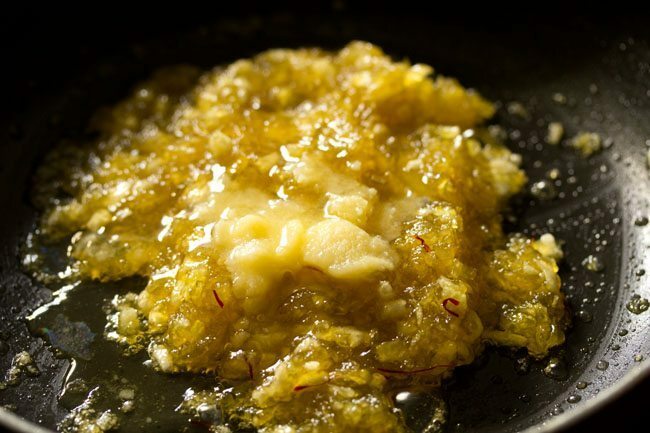 20. once the halwa mixture thickens and starts separating from the pan, then add 1 to 2 tablespoons ghee. 21. mix the ghee very well. 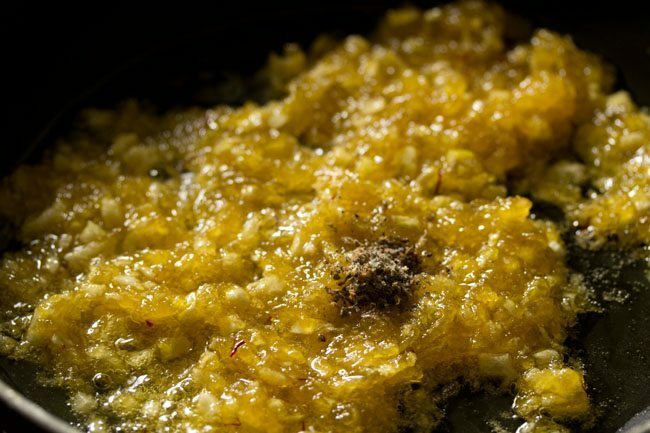 22. after adding ghee continue to saute on a low flame till the halwa starts separating from the pan. this will take 2 to 4 minutes. 23. then switch off the flame and add ¼ teaspoon cardamom powder. 24. also add the cashews and raisins. 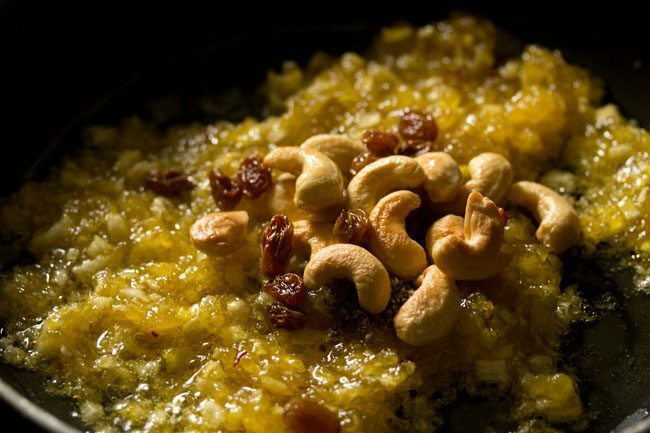 26. let the kashi halwa cool down a bit and then serve. avoid serving hot as its very hot due to the sugar syrup consistency. 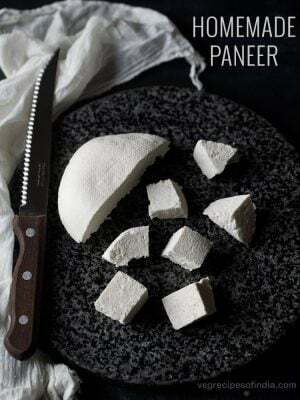 you can even serve white pumpkin halwa warm or at room temperature. 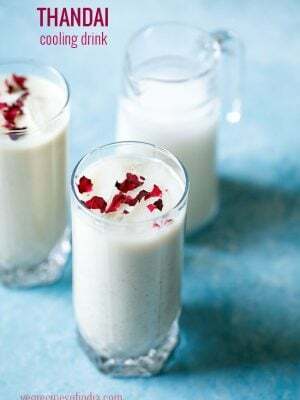 Hi mam, can I try this halwa making after squeezing out of all water from Ash gourd.. because my kids likes to drink this water as juice. yes you can do this. then when cooking ash gourd you can add some water if starts sticking to pan. Shelf life of Kashi halwa? I am fan of your site. I love your recipes the way you explain them. I have tried many and yes they came out very tasty. 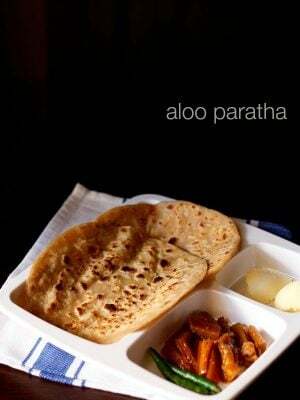 I have tried missi roti first then sundals, some south Indian and bengali dishes. My God my family and friends have fallen in love with baingun bhaja. Your whole discription helped me a lot. I have told my friends to refer your site. I did know how to cook. Your site is helping me lot. Mam I have a request can please post how to make churma laddoo. If you have already posted then can you please send link. thank you much priyanka. felt good reading your comment. i have got a couple of requests to add churma ladoos. so will add them. congrats shuchi 🙂 best is to read the manual as it explains everything. moreover if you want, some person also comes from the company to show you the working of the oven. its very easy. first you need to preheat the oven before baking. timing and temperature will depend on the recipe. if there is a timer, then you can set the timer. then place the baking pan or tray in the preheated oven and bake for required amount of minutes. you can set the time if you have the timer option in the oven. or else just keep a note from outside with a watch or stop watch. always use the middle rack for even baking and keep both the top and bottom heating rods/elements on. this helps in even baking. looks simple and delicious ? 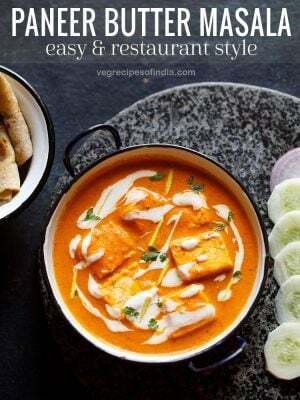 dear dassana amit thanks for sharing the good and hygienic recepies. your videos and vivid description is really good and no other blog gives so well. keep it up and greetings for navrathri. thanks for positive views and your appreciation means a lot to us. wish you a happy navratra festival.